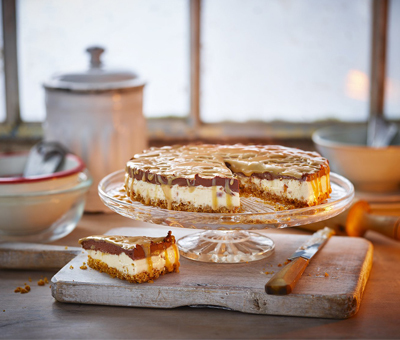 This delicious recipe combines two our favourite products, condensed milk and caramel. The cheesecake is made up of a crumbly base, a scrumptious peanut tasting middle topped off by a chocolate cheesecake layer and all of that is finished off with a beautiful caramel drizzle. Put the crushed biscuits in a bowl with the melted baking spread and mix well. Press the mixture well in the tin. Refrigerate for 10 minutes. Whilst the base is chilling, beat together the cream cheese and the condensed milk. Divide the mixture between two bowls. Add the peanut butter to one bowl. Pour the peanut butter cheesecake mixture over the chilled base and freeze for 15 minutes. Meanwhile, mix in the melted chocolate to the other half of the mixture. When the peanut layer has set, spread over the chocolate cheesecake mixture. Then pour over the chocolate mixture and return to the freezer for 2 hours. Ten minutes before serving, remove the cheesecake from the tin onto a serving plate. Beat the caramel in a bowl to loosen it and then drizzle onto the cheesecake using a teaspoon. Why not try our banoffee cupcakes or banoffee sundaes to use up the rest of the caramel? If you want to make this recipe ahead, freeze and use within one month.